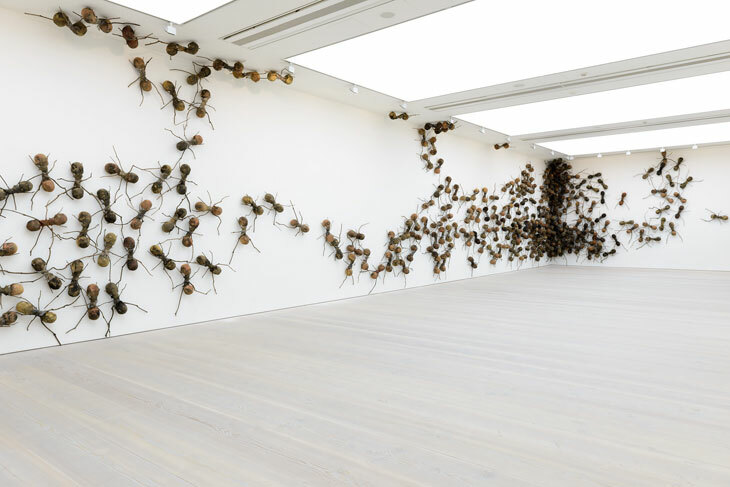 Installations of hundreds of sculptures representing fifty centimetre long ants take over public buildings. Their bodies are made up by the assembling of two human skull casts as if the Santa Marta-born artist were attempting to summon death in life. Rafael Gómezbarros’ work makes visible the overlooked. His intention is to address the plight of millions of displaced people who constitute the invisible but pervasive mass of immigrants crossing the planet. Buried in the narrative of diaspora lays a tribute to thousands of Colombians who suffered internal displacement and violent deaths as casualties of the armed conflict that wreaked havoc in the country for the most part of the last fifty years. Ants being usually associated with hard labour and a complex social organization are turned into phantasms of the disappeared, ghost like figures that have acquired the capacity to take over national monuments. Gómezbarros previously deployed his legion of ants onto historical buildings such as Quinta de San Pedro Alejandrino – the haçienda where Simón Bolívar spent his final days – as well as Barranquilla’s customs building. In Bogotá, he invaded a commercial gallery with one thousand polyester cast creatures and covered the National Congress’s stone façade, his most meaningful attempt to address the national security policies that endorsed a violent status quo for decades. Entitled Casa Tomada, the work makes a very particular reference to a short story by Argentine writer Julio Cortázar, in which the inhabitants of a large mansion become invaded by elusive presences announced solely by muted sounds. In the context of these public art interventions, the metaphor reminds the viewer what Cortázar himself declared shortly before passing away: unless a country buries its dead, they will always be remembered as ghosts in the attic.